Want to be notified of new releases in lotharschulz/clair? Note: The master branch may be in an unstable or even broken state during development. Please use releases instead of the master branch in order to get stable binaries. Clair is an open source project for the static analysis of vulnerabilities in application containers (currently including appc and docker). In regular intervals, Clair ingests vulnerability metadata from a configured set of sources and stores it in the database. Clients use the Clair API to index their container images; this parses a list of installed source packages and stores them in the database. Clients use the Clair API to query the database; correlating data is done in real time, rather than a cached result that needs re-scanning. When updates to vulnerability metadata occur, a webhook containg the affected images can be configured to page or block deployments. Our goal is to enable a more transparent view of the security of container-based infrastructure. Thus, the project was named Clair after the French term which translates to clear, bright, transparent. When would I use Clair? You've found an image by searching the internet and want to determine if it's safe enough for you to use in production. You're regularly deploying into a containerized production environment and want operations to alert or block deployments on insecure software. Clair is officially packaged and released as a container. Clair is professionally supported as a data source for the Quay Security Scanning feature. The setup documentation for using Clair for this environment can be found on the Quay documentation on the CoreOS website. Be sure to adjust the version of the documentation to the version of Quay being used in your deployment. NOTE: These instructions demonstrate running HEAD and not stable versions. The following are community supported instructions to run Clair in a variety of ways. A database instance is required for all instructions. If you don't have a local Kubernetes cluster already, check out minikube. Docker Compose may start Clair before Postgres which will raise an error. If this error is raised, manually execute docker-compose start clair. You can find production users and third party integrations documented in their respective pages of the local documentation. What do you mean by static analysis? There are two major ways to perform analysis of programs: Static Analysis and Dynamic Analysis. 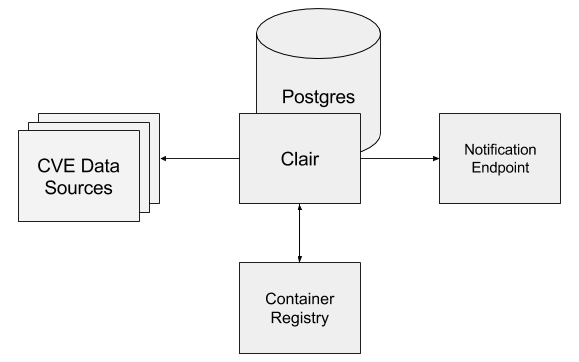 Clair has been designed to perform static analysis; containers never need to be executed. Rather, the filesystem of the container image is inspected and features are indexed into a database. By indexing the features of an image into the database, images only need to be rescanned when new detectors are added. What data sources does Clair currently support? What do most deployments look like? I just started up Clair and nothing appears to be working, what's the deal? During the first run, Clair will bootstrap its database with vulnerability data from the configured data sources. It can take several minutes before the database has been fully populated, but once this data is stored in the database, subsequent updates will take far less time. What terminology do I need to understand to work with Clair internals? How can I customize Clair? The major components of Clair are all programmatically extensible in the same way Go's standard database/sql package is extensible. Everything extensible is located in the ext directory. Custom behavior can be accomplished by creating a package that contains a type that implements an interface declared in Clair and registering that interface in init(). To expose the new behavior, unqualified imports to the package must be added in your own custom main.go, which should then start Clair using Boot(*config.Config). Are there any public presentations on Clair?